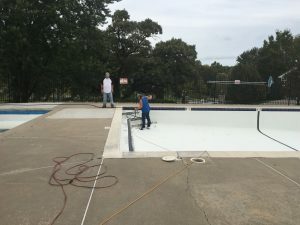 Although the pool is closed for the season many projects continue to be completed. Here is a brief update on those projects. Northland Pools repainted the pool’s surface, repaired cracks and the blue tiles. The new epoxy painted surface will last 5-7 years. The pool’s new paint will cure over the winter and be ready for use in next pool season! The board obtained three separate bids to complete the needed plumbing work at the pool’s pump house. 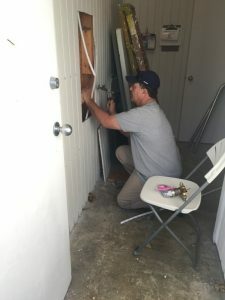 RB’s Home Services was chosen to complete the repairs. A new push button, self termination shower valve replaces the leaky shower handle that was difficult to turn off. A hot and cold water mixer was purchased installed to compete the automatic shower install. The installation of an automatic shower will guarantee that the water will not be left on and wasted. 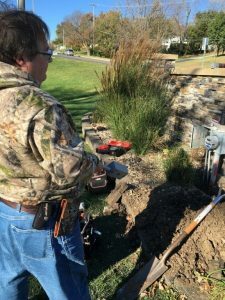 Two outdoor water spigots were replaced due to leaks. 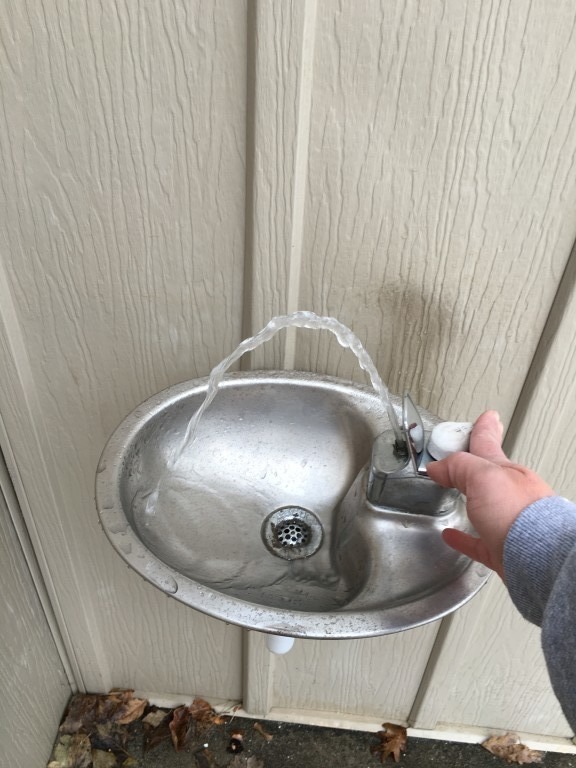 The new outdoor spigots will eliminate the problem of pooling water on the pathway to the women’s restroom. 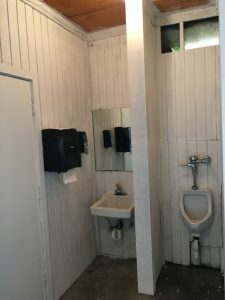 The leaky water supply line to the women’s hand washing sink and men’s urinal, were both repaired. 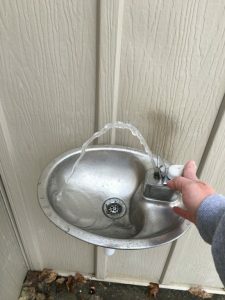 Finally, the water fountain was remounted to the wall and repaired. Once the pool is filled half way, the pool house will be properly winterized by Northland Pools. 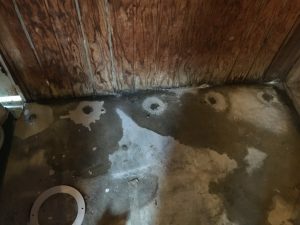 The 5 year committee suggested termite inspections and then damage was found which resulted in treatment bids that were gathered. 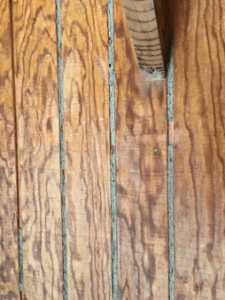 On the back wall of the pool’s pump room are termite mud tubes. The board gathered three bids to treat the pool house for termites and chose to use The Bug Man, LLC for the job. 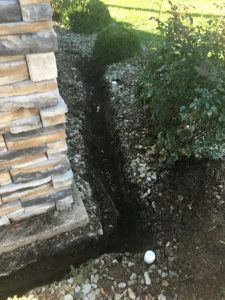 While treating the property, workers pulled live termites to the surface! 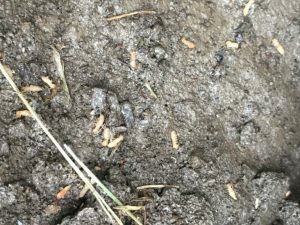 The live termites were found in the soil directly behind the pump room wall where the mud tubes were visible. 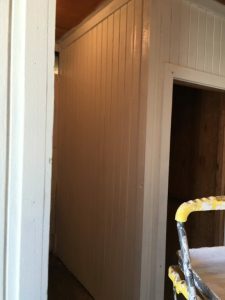 Painting of the men’s restrooms was started on Dumpster Day, but remains incomplete. This project will need to be completed in the spring once the pool chairs are removed from storage. We appreciate the volunteers who stepped up to help with the project. When neighbor’s are able to volunteer their time to complete projects it is wonderful help to the whole neighborhood! Please contact a board member if you’d be willing to volunteer time to paint this spring. All supplies will be provided. The sign at the 83rd street entrance got a new updated LED light, since the previous one was vandalized. The new energy efficient LED light is controlled by a photo sensitive cell that’s allows the light turn on and off automatically. 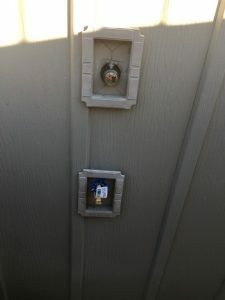 (this will also automatically control the Christmas lights hung on the fencing during the holidays) The new LED light was posted on a stake driven over 2 feet into the ground to prevent vandalism. 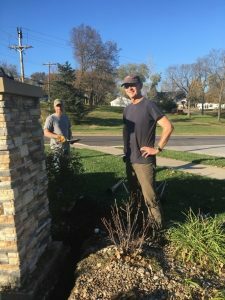 Bob Hiatt and Matt Ryan volunteered their time to dig the 2 foot deep trench, which came at a savings for the neighborhood. 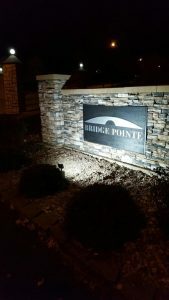 JDW, Jeff Williams completed the work installing sign’s new light.